If you’re considering moving to Southampton then you’re probably wondering what the area is really like, and maybe looking for a few tips from people who live in the area. Solent Removals know the area well and we’re pleased to share this, our first ‘moving to’ guide. Nicknamed ‘The Gateway to the World’, Southampton grew from a medieval settlement to a bustling borough in Hampshire with busy docks, world-class universities,and a popular football club. But the city’s appeal lies beyond the nightlife and the heritage attractions. Sure, people flock to the bustling port, the WestQuay shopping centre, and the top-ranked University of Southampton. But there’s much more to ‘Soton’ than all that. To fully appreciate this city’s cultural offering, you need to look beyond its links to the Titanic and the luxury cruises. You need to see this boomtown for the friendly and welcoming city that it is. Moving house, whether to Southampton, Portsmouth, Winchester or Bournemouth, or any of the other major cities and towns in the area can be a tad confusing at first, especially if you’re new to the area. Southampton can be particularly confusing because this county borough is made up of over 30 wards and suburbs, and too many exurbs to mention. But one thing is clear: it’s a thriving city. With growth concentrated at the very core of the city, the nearly 240,000 inhabitants build their homes in the suburbs. As they fan out towards the outskirts, house prices are rising toward the suburbs as well. Back in 2014, the largest property price rises in Rightmove‘s five-year forecast were earmarked for Southampton. Even with Brexit looming, Southampton was indeed one of the counties with the fastest growing housing market last year. Demand for houses here won’t be swayed by economic malaise. The average property price here was £344k in 2018, according to Plumplot. So, you’d pay nearly £50k more for a house in Southampton than for a typical British home. However, the average annual price change last year was £9.3k, twice that of the typical house in the UK. So, it’s clear that a house in Southampton makes an excellent long-term investment, and the sooner you buy one, the more you save. If you’re planning to study, work, or put down roots in Southampton, then finding the right school for your children shouldn’t be very hard. Thanks to the Compare School Performance service and the School Guide league tables, the latest Ofsted reports and progress scores are a mere click away for future Sotonians. Browsing these websites, you’ll soon see that the county is dotted with primary and secondary schools, as well as high-schools and colleges. An excellent selection of community schools is available for primary school children, such as the Bitterne Manor school by the bay, rated Outstanding, and St. Denys School in Portswood. Academies like Beechwood Junior School in Bitterne and Ludlow Junior School in Itchen are also very popular. Faith schools like Springhill Catholic School in the Polygon and Freemantle CofE close by have also consistently produced good results. There’s no shortage of secondary schools in Southampton, either. Bitterne Park School, a community school in Midanbury with a large catchment area, takes in many of the local school children. Independent schools like The Gregg School in Townhill Park and The King Edward VI School in the Shirley area draw in many students as well. Upper Shirley High School and St. Anne’s Catholic School, an academy classed as Outstanding by Ofsted, are also highly-rated by parents. But enough about education. Let’s move on to entertainment. Southampton is a city that brings out the child in you. All it takes to show your family a fantastic time is a day out at the Play Shack Hedge End or the Children’s Pleasure Park. And when your inner child has had enough of swirling in the merry-go-round, there’s always time for a refreshing dose of retail therapy. If you’re considering relocating to Southampton but don’t already know the extent of the retail options on offer then be prepared, when you live in Southampton, shopping sprees come with the territory. The bustling WestQuay shopping centre, with over 130 shops and venues, is within walking distance of Southampton Central. If, after all that shopping, you can squeeze in a quick play or an act of ballet, the Mayflower is at your service with witty stage shows and a danseuse that twirls to your tune. If you’re passionate about the outdoors, you can connect with nature in Southampton. Everywhere you turn, there’s a park for the young ones to play ball and have a picnic. Walk the dogs while the children play tennis, basketball, and table tennis at St. James Park. If you’re itching for a family cycling tour, ride your bikes along the River Itchen at the Riverside Park. Drown out the noise at The Common, Southampton’s lush oasis in the urban jungle. Or go ape at the aptly named amusement park in Itchen Valley Country Park. Better yet, treat your inner child to a fun-filled escapade with New Forest Activities, an outdoor adventure company in nearby Beaulieu. Paddling, archery, battlefield parties, hen parties, and other thrilling experiences are yours to enjoy round the year if you live in Southampton. Nurture their love of animals with a trip to Oasis Down to Earth Farm. For a more hands-on experience, spend a day at Manor Farm, where animals of all shapes and sizes will try to grab your attention. When they’ve had their fun, the kids can play with the combine harvesters and toy tractors on-site, while you catch your breath and grab a bite. Speaking of skippers, treat the bouncy bambinos to a ferry trip on the River Itchen; better yet, sail across the river aboard the S. S. Shieldhall, a steamship with a story. If you’re more of a museum person, then you’ll be delighted to see the interactive displays at the Tudor House and Garden. SeaCity Museum is the place to go for tales of the Titanic and life-like displays that reenact the most important day in the history of the city. Finally, Solent Sky Museum will spellbind the little ones with iconic treasures of British aviation heritage, such as the legendary Spitfire. With hundreds of highly-rated restaurants in Southampton, you’re bound to find one for every taste and occasion. Most local eateries describe their menus as British. But you’ll find countless others that offer Chinese, Indian, Thai, and Italian dishes as well. There’s no shortage of steakhouses or pizzerias either, and you can always pop into a local café for brunch. Whether you’re into fine dining with a view of the marina or nibbling on titbits at the tavern, there’s a restaurant in Southampton to appease your appetite. Local gourmands recommend Uptons of Bassett for their flavoursome full English breakfast. Eco-friendly pizzeria Popsi’s will entice you with its open kitchen and classic hand-written signage. And vegetarian-friendly Piecaramba! is a pie place with a loyal following. There’s no shortage of cocktail lounges, bistros, and alehouses in Southampton. So, when you have a hankering for a pint, do like the Sotonians do. Head over to the local pub. It’s tipples on tap at the Dancing Man Brewery. Though it hasn’t been around long, DMB is a brewhouse with history, set in a 14th century stone building called the Wool House. Another watering hole with British flair is The Dolphin Pub. This iconic Southampton establishment is where the locals come for live music and traditional Sunday roast. Whenever you’re in the mood for a tipple at the Tudor taproom, head over to Juniper Berry, as British as a pub can be. If you like your bars happening, then whet your whistle at The Social. Head over to Bedford Place and get ready to play pool and mingle with the latest generations to grace the local university. Of course, you simply can’t live in Southampton and not have your bespoke bitters at The Titanic. And you may just as well get a double dose of history with a visit to The Duke of Wellington. 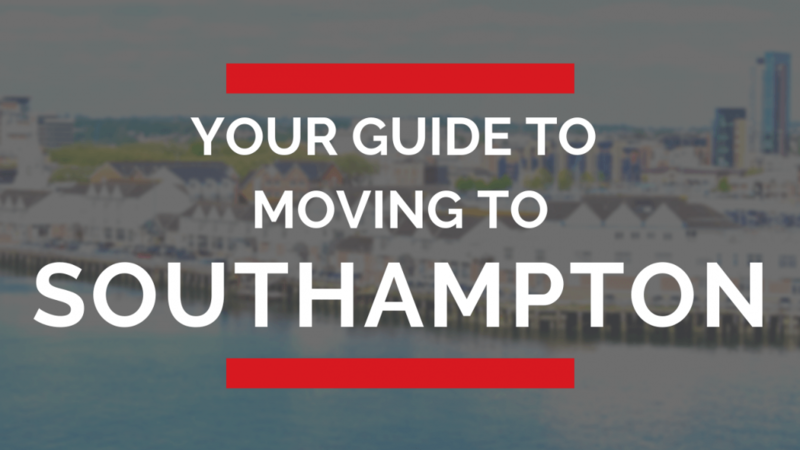 This concludes our brief guide for moving to Southampton. By no means exhaustive, it features a handful of local attractions; the tip of the iceberg, really – pun intended. But there’s only one way to experience this city fully, taking in all it has to offer and connecting with the locals on a deeper level. You need to see it to believe it. Before you get you move underway be sure to chech out our guide to the real cost of moving house or download our moving house checklist.